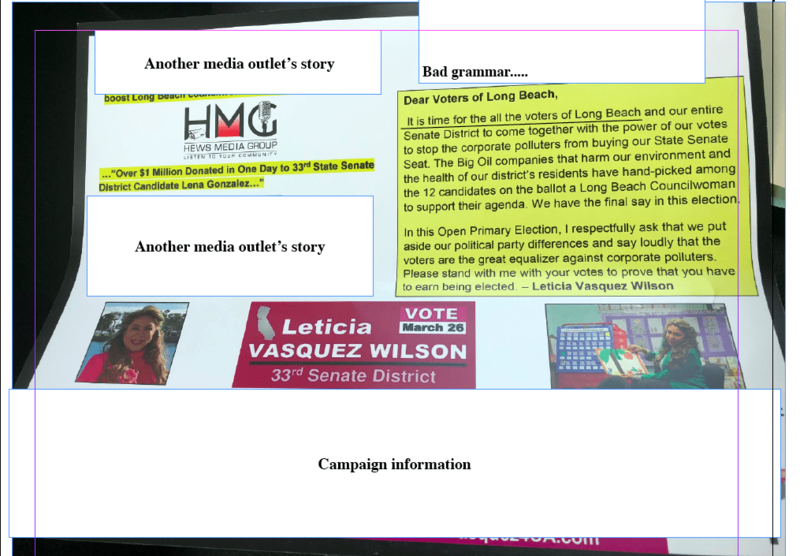 In an ironic twist, Central Basin Director Leticia Vasquez, who claims every story Hews Media Group published about her since 2013 is false, cited an HMG article in a campaign mailer sent out to voters this past week. The citation referred to Long Beach Councilwoman Lena Gonzales receiving $1 million in one day from an oil lobby. The mailer also contained an egregious grammatical error that should have voters questioning Vasquez’ oversight competency. Vasquez is running for the 33rd State Senate District vacated by Ricardo Lara. HMG-LCCN texted Vasquez for comment with no response. HMG-LCCN also texted Cerritos resident Melinda Kimsey, who falsely and maliciously accused a teacher of sexual harassment and pedophilia and was fined $20,000 in court for lying, for comment. Kimsey is an outspoken supporter of Vasquez in Cerritos, she also did not respond. Mailer sent out citing four media outlets including HMG-LCCN. Click on image to view larger document. Vasquez’ flailing campaign has seen its share of problems and missteps, up to and including the latest grammatical error on her campaign mailer. Vasquez and her husband-lawyer Ron Wilson sent out a letter to over 200 people and candidates related to the 33rd District race threatening them with defamation if they cited anything related to the defamation Vasquez filed against HMG; a case she lost and was ruled to pay HMG’s attorney’s fees. Vasquez was also slammed by her fellow Central Basin Board-members when she was recently removed from her Metropolitan Water District Board seat. One of the lawsuits was recently filed by Angel Gonzales, her long-time political consultant, accusing Vasquez of non-payment.